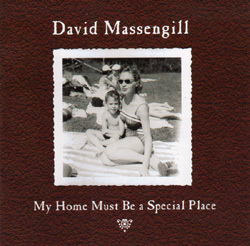 David Massengill"My Home Must Be a Special Place"
Gadfly Records is proud to announce the release of "My Home Must Be a Special Place," the first CD in nearly five years from master storyteller/singer/songwriter David Massengill. Known for such signature songs as "Number One in America," "Rider on an Orphan Train," and "My Name Joe," Massengill has long been widely regarded as one of the most articulate and creative performers of the last two decades. This new release is a theme album of songs recollecting his childhood, from his first kiss, to a crush on a teacher, to stories about his parents. I've lived for half a century now, and for half that time earned my way as an artist. As a child of my times, I looked to the future and the promise of a better world. Some years ago I noticed a shifting of perspective in my work. As though responding to a siren's call, I answered the irresistible impulse to revisit the past. And like many others before me, I discovered it is easier to improve the past than it is to improve the future. It only took me 50 earned years to discover my purpose as an artist was to look back. It's as though I've been preparing my whole life to write these songs, where I aim to make the personal of family lore and hometown memories a universal. My domain is the life and times of what I have come to know as the very dear past. Back before we all got to be so mad at each other. That's where I'll be in the foreseeable future. Back in the past spotlighting moments of humanity. 10. Where Did Miss Nancy Sterett Go?